Soft vanilla meringues served with caramelised pineapple slices, almond tuiles and a mango and passion fruit coulis. Peel the pineapple and remove the eyes. Cut the passion fruit in half and scrape out the pulp. Pass the pulp through a sieve to remove the seeds. Juice the lime. Cut 6 equal sized slices from the pineapple and then cut the rest into pieces. Cut the mango into pieces and place in the bowl of a food processor. Add the lime juice, passion fruit juice and the pineapple pieces. Blend until smooth, adding a little water if necessary. Set aside until ready to serve. Place the 50g caster sugar in a frying pan and melt to form a caramel. Remove the core from the pineapple slices and then add the slices to the pan. Add the butter and the 4 spice mix and then leave to caramelise over a medium heat for 2 minutes on each side. Whisk the egg whites until thick. Once they reach the firm peak stage, begin adding the sugar and the vanilla powder, whisking all the time. Pour the mixture into round silicone moulds. Place in the microwave and cook for 20 seconds on a low heat. Melt the butter and then mix with the icing sugar, flour, chopped almonds and the orange juice. Place the mixture in the fridge to chill. Pour the tuile mixture onto a silicone baking sheet and cook for 5 to 6 minutes. As soon as the tuile starts to turn golden brown, remove from the oven and leave to cool on the baking sheet. Once cool and solidified, break the tuile into small pieces. 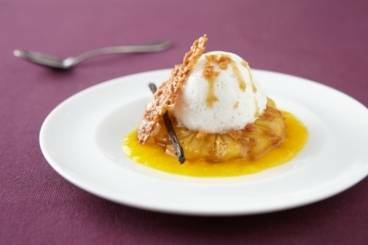 Place the îles flottantes on top of the pineapple slices. Drizzle the mango and passion fruit coulis on top and finish with the almond tuile pieces.